I'm a lifetime reader and writer. My interest in both pursuits sparked when I read Frank Herbert’s Dune in the fourth grade. The novel had a heavy influence on my thinking and view of our world, and other worlds. 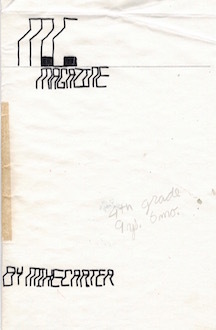 I started my first ‘publication’ shortly thereafter, titled "M.C. Magazine" (© 1984) and later “Mike’s Mini-Mag and Fun Things to Do.” It had crossword puzzles, word searches, and a few very short stories. I copied and laminated the magazines at the local high school and handed them out in the neighborhood. I continued creative writing through high school and college, but I paused to pursue a law career. As a lawyer, I have spent two decades writing for judges throughout the western United States, primarily in California and Washington. After my long hiatus, I returned to creative writing. I write short fiction and creative non-fiction mostly for personal enjoyment, but also to share with family, friends, and a few publications. My stories have placed in writing competitions and are published in print and online journals, and in print anthologies available through retail sellers and independent publishers. I hold a J.D. from Santa Clara University School of Law. I studied Roman Law briefly at the University of Oxford, Magdalen College, in Oxford, England. I also have a B.A. in Psychology, with a minor in Classical Studies, from the University of Washington. In addition to reading and writing, I enjoy fishing, cast-iron cooking, and spending time with my lovely wife and our sons. I also enjoy occasional India pale ales.